The new KoCoS EPPE C8 Power Quality and Power Line Monitor, available from Westek Electronics , is a comprehensive electrical parameters analyser in a compact, panel-mounting (144 x 144 x 280mm deep) instrument package. 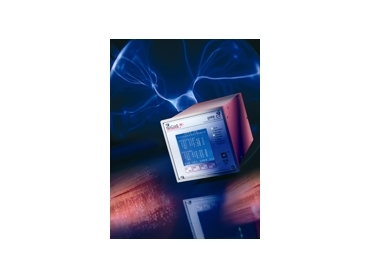 This monitor is suitable for a large range of applications including busbar and feeder monitoring, individual load monitoring as well as power quality analysis in accordance with EN 50160. The KoCoS EPPE C8 Power Quality and Power Line Monitor has a large number of communication ports to enable remote data acquisition and control, including USB Master/Slave, EtherNet (optical/electronic) TCP-IP, RS 232/RS 485 and an internal modem. For synchronisation utilising DCF (Dynamic Count Filter), NTP (Network Time Protocol) and GPS inputs are available. Local communication is provided by means of a graphical, touch-screen 128mm TFT display with entry through a user-friendly, intuitive, six “button” main menu. The KoCoS EPPE C8 Power Quality and Power Line Monitor is provided with a 32MB flash RAM and 2GB data memory. The KoCoS EPPE C8 Power Quality and Power Line Monitor has 4 voltage inputs, 4 current inputs, 12 binary inputs, 2 dry magnetic relay outputs and 2 electronic relay outputs. Voltage is measured to 600V rms AC. Current can be measured directly to 40A rms AC or indirectly utilising current transformers or current clamps. Current and voltage are sampled at 30kHz frequency using high resolution 16 bit ADCs, and digital inputs are sampled at 8kHz. Parameters measured include line and phase voltage, line current, frequency, phase angle, THD, harmonics, inter-harmonics, active, apparent and reactive power, active, reactive and apparent energy, power factor, form factor, crest factor and impedance. The KoCoS EPPE C8 Power Quality and Power Line Monitor also resolves unbalanced voltage/current values into symmetrical components. Display modes are large, including in addition to numerical readouts, bar graphs (for example, current, voltage, power, flicker), harmonics in bargraph format, vector (phasor) displays indicating current and voltage displacement angles and magnitudes as well current/voltage displacement phase angles. Furthermore histograms and trend lines of the above-mentioned parameters can be displayed. The KoCoS EPPE C8 Power Quality and Power Line Monitor is a class A device in accordance with IEC 61000-4-30 with accuracies better than 0.1% for voltage and current inputs.